Though I currently practice family law exclusively for Cordell & Cordell, I was previously both a prosecutor and defense attorney so I have participated in countless depositions and have seen cases won over a few careless words by a witness who is not prepared. Here’s the thing about depositions: most people don’t prepare for them like they should and are nervous about the process to boot. I have seen police officers who have been deposed hundreds of times crack in a deposition when they forget what they wrote in their report. So here are 5 divorce tips for men on how you should prepare for a deposition to ensure your testimony does not negatively impact your case. You should know the topic you are going to be asked questions about. What that means is that you should prepare as though you were going for a job interview. If you are being deposed in a divorce case with young children you can expect a series of questions about your child. Not knowing their birthdays or what grade they are in is a terrible way to begin a deposition wherein you are arguing for increased parenting time. I have seen a mother testify in trial that she did not know when her son graduated from high school or started college. Funny thing is she home-schooled him. Research is the key here. If you don’t know your kids’ birthdays, grades in school, favorite activities, friends’ names, etc., then you are not going to do well. You should rehearse answering the questions if you are easily made nervous. While your attorney will not look or sound like opposing counsel, he or she should be able to predict what kinds of questions opposing counsel will ask. Having your divorce lawyer examine you as if at a deposition prior to going into a deposition can help quell any butterflies that may be flitting about your stomach. Most people are not natural public speakers and this process makes them nervous, but you need to practice what kinds of answers you may be asked to give. You need to always tell the truth during this or any other part of discovery. Your attorney should not be telling you what to say. They may help you phrase your response so it is clear, but your answers must be your own. “Umm” and “uhh” will invariably come out in your transcription. The last thing you are going to want at trial are these “thought” words. It can make you sound as though you are falsifying your answers or you just don’t know them. The way to prepare for this goes back to rehearsing again. One thing that many people do not realize is how often they have or use these audible fillers in every day conversation. Another fact that many people don’t realize is that transcriptions are not real time, so silence does not count for anything. Here is an example of two answers from depositions to the same question. Multiply this time the 200 or so questions being asked in your mind and you will see the difference. Question: How many children do you have and when was each born? Answer: Um, I have three kids. Let’s see… Adam was born in 1992, April 2. Becca was born in, umm, 1995 in November. And, uh, Mark was born August 3, 2000. Answer: I have three kids. Adam was born in 1992, April 2. Becca was born in 1995, in November. And, Mark was born August 3, 2000. While these answers contain exactly the same information, court reports are required to record every audible response whether or not it is an actual word. An entire transcript of the former will be a pain to read for all involved, which could include the judge. A transcript of the latter will present someone is confident in their responses and sure of the facts. If you think that you need help with this, call yourself and leave an unrehearsed voicemail about what you have done over the last hour. Don’t write a script and read it, but just talk to your voicemail and see how it sounds. If you are annoyed listening to yourself “umm” and “uh” about your day, imagine how it will sound if it has to be read into the record. You can be sure that opposing counsel will want to give an accurate account of exactly what was previously stated. The difference in the two responses may seem small because at the exact instance you are answering the question you may not know. The truth however is that during 2011, you did know how much you made if you ever saw a check stub. If you say that you do not remember, your divorce lawyer can ask if there is anything that would help you remember. If there is something that will remind of what you do not remember – such as looking at a paycheck stub from 2010 – your attorney can show you that item, take it away, ask if you remember now and you can answer. If you answer, “I do not know,” then there is nothing your attorney can show you to make you know. Now the question takes on a whole new gravitas. We’re not talking about being able to show a simple paycheck stub from that year to refresh your recollection. Rather, we are talking about a series of many events and unless you kept a calendar, it is going to be difficult to refresh your recollection with some items. The difference between not knowing and not remembering though is huge. If you do not know, then you are putting yourself in a position of having no knowledge of those weekends. If you do not remember, however, you can always recall at a later date after seeing a picture, talking to your kids about those weekends, or thinking about special events. This is why it is important to know those answers about your kids. “I don’t remember what grade Becca is in” is still not a wonderful answer, though. Furthermore, saying “I don’t remember” to every question is not going to sound good when the trial rolls around and you have suddenly remembered everything that was forgotten in your deposition. Going back to my No. 1 tip, you should know the answers to various issues and questions that are obviously going to come up. Also, there are situations where it is best not to know or where neither answer is appropriate. If you get in a rut with answering, “I don’t recall” you may end up making an admission. Many attorneys will ask a series of questions trying to get you in a rhythm and then throw in one similar to the above. That’s why the next tip is so important, yet so simple. It may sound odd when talking about topics as serious as divorce and child custody that some people simply do not pay attention to the question asked. But I have personally seen homicide detectives and seasoned undercover agents get tripped up because they get into a rhythm answering questions. b.) Where do you work? c.) How long have you worked there? d.) To whom are you married? These may be lead in questions to establish a foundation for the rest of the questions, but they are also getting you into a rhythm of the conversation. When you get into such a rhythm you tend to zone out because you brain thinks, “I can do this all day. Look, Mom! No hands!” Next thing you know you aren’t paying any attention to the questions. Men are particularly good at this, almost at a professional level. Don’t kid yourself; just remember all those times when you were “listening” to your wife and nodding in agreement but you were focused on the late fourth-quarter game-winning drive. I tell my clients that they need to take a breath before answering any questions from the judge, opposing counsel, or me. 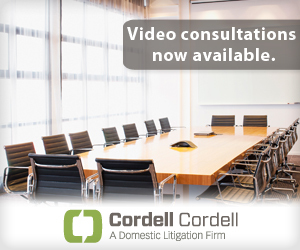 To set up an appointment with a Cordell & Cordell mens divorce attorney, including Indianapolis Divorce Lawyer Nathan A. Hacker, please contact Cordell & Cordell. ← Can They Apply My Tax Refund To Child Support Arrears? good article – thank you. I just went through my depo, about 8 hours in total, and one comment that you might want to add is this: don’t answer the questions too quickly! I did this on occasion and I came off as being cocky.